Stuffed with brown sugar and raspberry, these "Apples Zinfandel" are baked in pastry and served with a sweetened red wine reduction. I always look forward to apple season to try new dishes. This year Facebook friend, Matthew Shelly, shared this recipe for Apples Zinfandel. Stuffed with brown sugar and raspberry jam, these apples are baked in pastry and served with a sweetened red wine reduction. It's a flavorful combination of ingredients and makes a beautiful presentation. I made a few small changes to Matt's recipe but didn't change his overall idea. 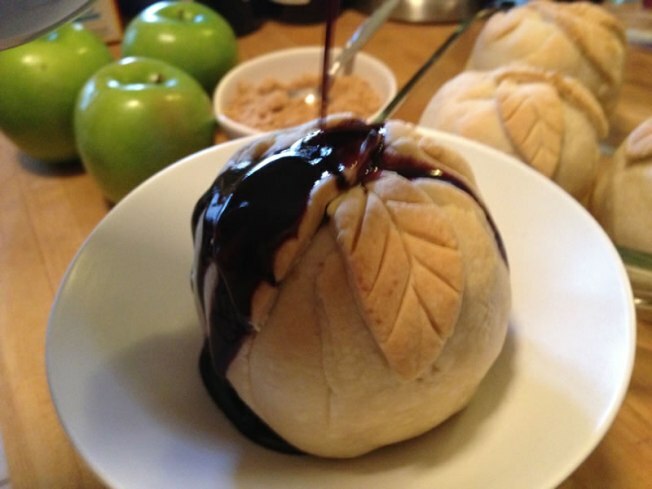 Wayne shows you how to make apple dumplings with Zinfandel drizzled over them. Cut butter and cream cheese into flour and blend until if forms a dough. Wrap dough in plastic and refrigerate for an hour. After an hour, roll dough on a floured work surface to large rectangle (about 12"x14"). 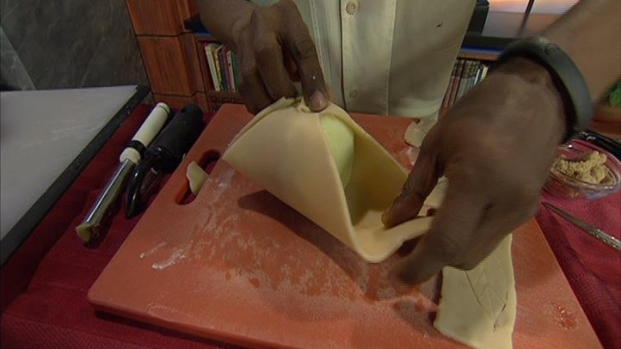 Fold dough over it self and roll out again to the same size. Repeat this process at least 7 times to create a multi-layered dough. Cut off a 1" strip along the long side and set aside. Cut the remaining dough into 4 equal portions. Working separately, roll each piece out further to a 9" square. Place an apple on each square. Fill the bottom with 2 teaspoons of the brown sugar and top with 2 teaspoons of raspberry jam. Bring up the sides of the dough to completely enclose the apple. Fold the flaps against the side of the apple and press them into dough to seal. Roll out remaining pastry strip to about twice its size. Cut 8 leaf shapes and press two it into the top of each dumpling. Brush all surfaces with the beaten egg. Place apples in a square baking dish and bake for 40-45 minutes or until golden brown. Meanwhile, pour zinfandel into a large saucepan and bring to a boil. Boil over a medium heat until mixture has reduce by half. Add sugar and stir to combine. Continue to boil until mixture has reduce to about 1/8 its original volume, about 15-20 minutes total. Add butter and stir to melt and combine. Remove from heat. Remove apples from oven and serve warm with a bit of the zinfandel sauce and whipped cream. Special note: The size of the apple (and difference between ovens) affects baking time greatly. These granny smiths were about 3 1/2" wide. Smaller apples or softer ones, like macintosh, will take less time to bake. *Matthew does not put sugar in his sauce. He felt the sweetness of the raspberry and brown sugar balanced out the flavor of the zinfandel sauce. Thanks again to Matthew Shelly for sharing his recipe. If you have any comments or questions, please send me an email at wayne@waynesweekend.com or follow me on Facebook or Twitter.